When my son was nine or ten, he used to watch movies endlessly while he played in our family room -- the same movies over and over again. While most children like to do this (the same movie until the parents are ready to scream), what was odd about this was his choices, films like Galaxy Quest, Mystery Men, and Pleasantville. He had really good taste. He watched movies that struck his fancy. One of them was Bowfinger. 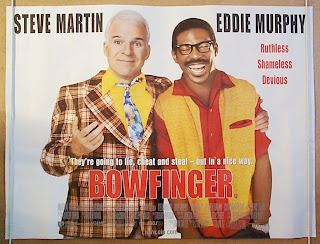 Bowfinger is the great, undiscovered comedy of the nineties. 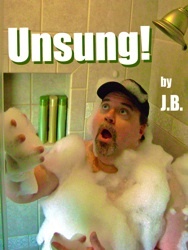 It is certainly one of the funniest: clever premise, clever ideas, and clever dialogue. It is the whole package. 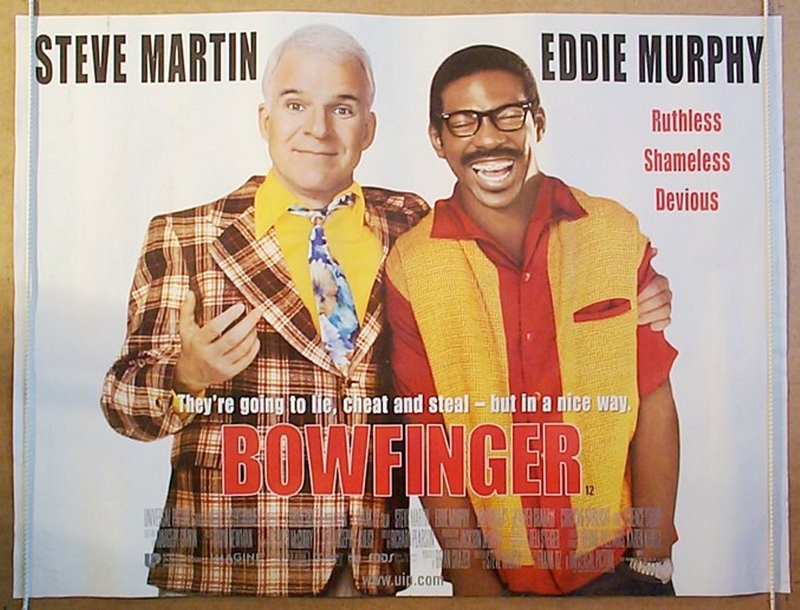 Bowfinger also walks a very fine line for a comedy; it is sharp and knowing without being arch or cynical, and it is trenchant and satiric without being mean-spirited or ugly. THE PLOT IN BRIEF: Unsuccessful producer/director Bobby Bowfinger (Steve Martin) decides to give filmmaking one more shot on the eve of his fiftieth birthday. With a script written by his accountant and the support of a loyal group of hangers-on, he concocts a plan to shoot the film guerrilla-style, without ever letting its neurotic star Kit Ramsay (Eddie Murphy) know that he is in a movie. Bobby assures the other actors that Kit has a very eccentric working regiment: Ramsay refuses to meet anyone working on the film before shooting, refuses to rehearse, and insists that every shot must be achieved in one take. This subterfuge works well until, realizing they need an actor to double for Kit in long shots, Bobby hires Kit’s odd twin brother, Jiff. Hilarity ensues. Besides starring in the film, Martin also wrote the script, and it seems to reveal all of his ambivalent feelings about Hollywood and moviemaking. Screenwriter Martin depicts filmmaking as worthwhile and ennobling, but acknowledges that Hollywood is soul crushing and ridiculous. Movie stars are shown to be pampered head cases, starlets will do anything for their big break, crack-pot religions control their famous followers’ lives, and even the illegal Mexican immigrants picked up at the border as a cheap film crew are reading Cahiers du Cinema by the film’s end. The casting is impeccable. Martin is at his manic best, and so much funnier than his toned-down, family-friendly Cheaper By the Dozen and Father of the Bride performances. While I have never been a fan of Christine Baranski, here she is cast in the role she was born to play: a past-her-prime, over-the-top diva -- a performance in all capital letters. In the dual roles of Kit and Jiff, Murphy is so much funnier and more sharply observant than he ever was under pounds of makeup in the unwatchable Nutty Professor films. In Bowfinger, he gets better results with just a pair of glasses and a set of braces. Director Frank Oz calls Murphy’s performance one of “perception and personality, rather than prosthetics;” I think Murphy deserved an Oscar nomination for this film. The film’s funniest scene involves Bowfinger convincing Jiff Ramsay to run across a ten-lane California freeway for the film. Jiff is assured that the hundreds of cars whizzing by are actually being driven by stuntmen. Jiff’s absolute terror as he runs the gauntlet and his screams of “Heavenly God!” are hilarious. Does this make me a sadist? The CGI employed in this scene is very convincing. The use of long lenses and the fact that it is obviously always Eddie Murphy in the shot really sells the joke. I also really like the film’s message about the participants in any creative exercise coming together and becoming something like a family. This is unexpectedly sweet. This seems to be a theme in many behind-the-scenes films about moviemaking, in films as outwardly different as Ed Wood and Boogie Nights. When I finished re-watching the film for this column, my wife turned to me and said, “They don’t make films like that anymore,” and she is right. There is a unique mix in Bowfinger of the sweet and the salty, the highbrow and the lowbrow, that is very difficult to achieve. It is the comedy equivalent of cooking the perfect soufflé. The film is rated PG-13, is clearly aimed at adults, yet has enough sheer silliness to entertain a precocious nine-year old. Did I mention the boy has really good taste? Ive always liked this film, with Jiff being the clear highlight. Eddie Murphy downplaying humour is 10x better than his usual overplaying. It's a great one! Terrible comedy and absolute time pass. It's just too good. Nice write up. I've always liked this one. One of my favourite little jokes is how Terrence Stamp's cultish guru character is actually a positive influence on Kit Ramsay, providing fairly sound advice. I convinced my parents to see this opening weekend over The Sixth Sense. One of the smartest decisions I've ever made in my life. Man, 1999 was the best. Nothing to do with Bowfinger, but I thought JB and his ilk would get a kick out of this TV news. Bryan Fuller ("Pushing Daisies") will feature classic Universal monsters in his new TV remake of the classic "The Munsters" sitcom, "Mockingbird Lane," for NBC: http://www.hollywoodreporter.com/live-feed/bryan-fuller-mockingbird-lane-munsters-nbc-350407 . Is it just me or does this guy seem to miss the whole point of The Munsters? They were The Universal Monsters done in silly sitcom style. That was kind of it. To take away the appearance of the Universal monsters is kind of missing the reason for their appeal.